Artificial pollination is especially challenging; greenhouse technology maintained under harsh conditions. 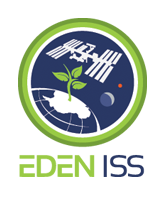 The Antarctic greenhouse EDEN ISS has weathered the polar night – as well as Antarctic storms and temperatures below minus 40 degrees Celsius – in its practical test under the direction of the German Aerospace Center (Deutsches Zentrum für Luft- und Raumfahrt; DLR). It has been yielding herbs, lettuce and freshly harvested vegetables to the 10-member overwintering crew in the Alfred Wegener Institute’s Neumayer Station III for the first time since the beginning of 2018. After more than half a year of operation in Antarctica, the self-sufficient greenhouse concept appears to be effective for climatically demanding regions on Earth, as well as for future manned missions to the Moon and Mars. DLR researcher Paul Zabel is overcoming challenges, as well as acquiring knowledge from cultivating plants under such harsh conditions. To the overwintering team, the fresh greens are a welcome change during their long-term isolation. Zabel will report on his experiences in a live transmission from Antarctica on 13 September 2018. Quite often, a storm prevents Zabel from making the 400-metre outdoor trip from the Neumayer Station III to the greenhouse. Under these circumstances, the control centre in Bremen takes complete responsibility for monitoring the plants and supervising the greenhouse. However, this has been necessary on no more than three consecutive days so far, so Zabel has been able to do a good job of ensuring that the plants receive continuous care. The importance of his presence on site has been demonstrated repeatedly at times when the greenhouse technology has run into difficulties under the extreme conditions and urgent assistance has been needed. “On one occasion, for example, I had to go to the greenhouse quickly because a screw had come loose in the thermal system, and the lamp cooling was no longer sufficiently ensured.” Small repairs like these are hardly foreseeable and teach the researchers about the greenhouse concept and how to make its design more robust in future. “It is important for us to be able to react when there are complications with the existing tools and resources on site. After all, the sound operation of a greenhouse on the Moon and Mars would be essential for survival,” says Schubert, the Project Manager. Forty different experiments are currently running in the greenhouse. This means a lot of work for Zabel, as he extensively analyses the cultivation of vegetables. His tasks include taking regular microbiological samples, examining the precise quality of the harvest, and periodically checking all systems, such as light, temperature regulation, and the nutrient- and carbon dioxide-enriched air supply. He also documents how fresh food is affecting the health of the overwintering team members. Gaining insights into Antarctic plant cultivation has so far been reserved for the international researchers on the project, but everyone will have this opportunity in the future. “Until now, we in the control centre have received daily images of the individual plants through 32 cameras in the greenhouse. The researchers involved have access to these images and can provide the relevant tips,” Schubert says. “Now, we are opening these plant images to the public via an online tool on the EDEN ISS project website. Anyone who is interested can take part live in our vegetable cultivation in the Antarctic.” Every day, photos of the individual plant cultivation boxes are automatically taken at a specific time and under special lighting conditions. These images are then transmitted to the mission control centre in Bremen and made available online. The plant growth can be followed via an interactive timeline. In this way, people can interactively participate in a technology that will become more important in the future. Eberhard Kohlberg from the Alfred Wegener Institute, who is the logistics manager for the Neumayer Station III and has been a member of the overwintering crew on several occasions, says how pleasant it is to have a garden with lettuce and herbs just around the corner: “Otherwise, the menu just consists of long-life products from the freezer and storage room.” Only at the end of October 2018 will the first supply aircraft be able to provide the overwintering team with fresh food items from the outside world once again. Neumayer III station manager Bernhard Gropp adds: “”We greatly value and enjoy the fact that regularly fresh salad, herbs and vegetables from the greenhouse enrich our diet. The positive effect is noticeable.” The last part of the winter is particularly challenging for the crew, as they gradually have to switch back to normal operation with many people at the station. Global food production is one of the key societal challenges of the 21st century. A rising world population and simultaneous upheavals caused by climate change require new ways of cultivating crops, even in regions with unfavourable climatic conditions. For deserts and areas with low temperatures, as well as space missions to the Moon and Mars, a closed greenhouse makes it possible to produce crops independently of the weather, the Sun and the season, while enabling lower water consumption, as well as the abandonment of pesticides and insecticides. With the EDEN ISS project, such a greenhouse model of the future is being subjected to long-term testing for one year under the extreme conditions of Antarctica. The EDEN ISS project is carried out in cooperation with the Alfred Wegener Institute Helmholtz Centre for Polar and Marine Research (AWI) as part of an overwinter mission at the German Neumayer Station III in Antarctica. Many other international partners are cooperating in a research consortium under DLR’s leadership to ensure that the greenhouse in Antarctica remains functional: Wageningen University and Research (Netherlands), Airbus Defence and Space (Germany), LIQUIFER Systems Group (Austria), National Research Council (Italy), University of Guelph (Canada), EnginSoft (Italy), Thales Alenia Space Italia (Italy), AresCosmo (Italy), Heliospectra (Sweden), Limerick Institute of Technology (Ireland), Telespazio (Italy) and the University of Florida (USA). The project is financed with funds from the European research framework programme Horizon 2020 under project number 636501. News about the project directly from Antarctica can be found on the EDEN ISS Facebook and Instagram channels, as well as through the #MadeInAntarctica hashtag on Twitter. Information compiled about the project is available at: www.DLR.de/EDEN-ISS.